"Uniting The World Through Our Children"
Choosing to become a Host Family is choosing to open your heart and your home to a foreign exchange student. Many of our host families rave about how wonderful the experience is for them and their whole family. If you are interested in making a difference in the life of one of our exchange students, please don't hesitate to contact us. For more information, call us today at 1-800-377-2232! Fill out the "Host Family Application" and you are on your way! After we receive your information we will set up an interview with your family and one of our area Representatives near you to give you more information about this wonderful program and also help match you with an exchange student who would best suite your family. From time to time we also have need of Temporary Host Families for a few days to a week or two. If you might be interested in serving in this capacity, please fill out the Host Family Application above and check the 'Temp' box. If you are replacing the family that started hosting the student at the beginning of the year, check the 'replacement' box at the top of the application. In order to view available students profiles, after you have been pre-screened and vetted by our staff, they will give you the password to our Host Tools to open more detailed available student Mini's and profile documents. Many smiling faces await you! 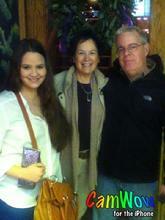 Ana Martinez (MX) with host parents Greg & Kim Entz. Host Family Guidelines--Steps in Placement in Spanish This four page document outlines in Spanish all the steps involved in placing an international exchange student with a host family in the USA. Host Family Guidelines--Steps in Placement in English 8-30-11 This four-page Guide outlines the steps involved in placing an international exchange student in your home and what to expect while they are living with you.. Sample MINI Profiles Sample MINI Profiles of Students available for placement in your home. Host Family VISA Regulations FYI--Updated 2-9-16 to help Host Families understand VISA regulations that might apply to their student ambassador. Host Family Affidavit 02-09-16 Host Family Affidavit inidcating you have read the Host Family Guidebook outlining expectations, understandings and agreements between host families and PEACE which must be signed and returned in order to become a Host Family for a PEACE Student Amabassador. Host Family Handbook Updated 1-23-13 This hand book explains in detail expectations of host families. It's a handy reference that covers most situations that host families are likely to encounter with students placed with them. Security Clearance Form 11-4-13 Completion of this form is necessary as the Department of State (DOS) requires sponsor programs to "Verify that each member of the host family household 18+ and older ...have undergone a criminal background check." Host Family Application 12-1-13 One Page Host Family Application Form which must be filled out to become a Host Family for a Peace Student Ambassador. Host/Student/Family Letters Letters written by members of host families, exchange students and student's families. Host, Student and Family Letters Letters written over the years. 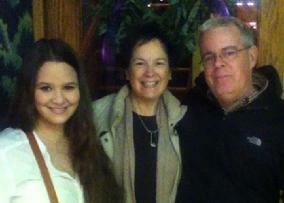 Student Ambassador, Ana Martinez (MX), with host parents, Kimberly and Greg Entz.